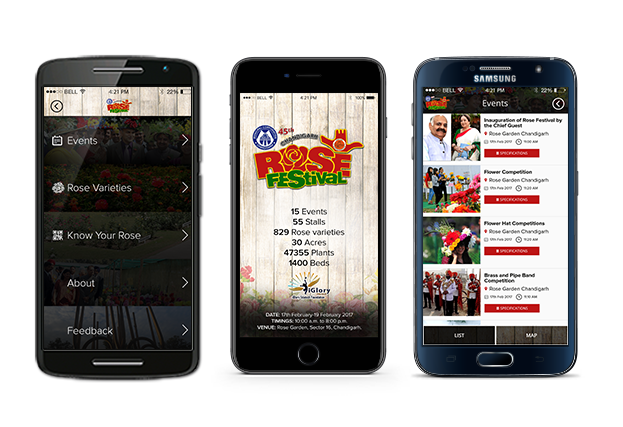 Netgains launches mobile app for Chandigarh Rose Garden Festival 2017. Rose Festival of Chandigarh is one of the biggest rose varieties shows which is launched in collaboration with Chandigarh Municipal Corporation and Chandigarh Administration annually. Chandigarh Rose Festival is a cultural eagerly-awaited event which is tribute to the magnificence of the rose. This festival is undoubtedly the best time to visit the place to enjoy the sight of colorful display of the largest variety of roses in one place. Our team has build the mobile apps for both Android and iPhone for this event. Our Mobile app developers had put forth custom design and quick turn around for this entire project. Users can get information for any rose by simply scanning the QR code of roses available near bed of roses. Users can get list of varieties of roses available in the festival. Users can get list of all upcoming events in rose festival and find them via google map. Users can provide feedback for each event as well as for the entire festival. Netgains offers a wide range of mobile app development services to deliver great results to our clients.